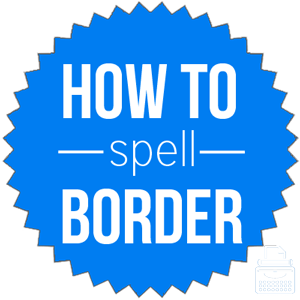 Spelling of Border: Border is spelled b-o-r-d-e-r. Definition of Border: A border is the outer part or edge of something or a specific area; an ornamental design at the edge of something, such as a rug or poster; a boundary dividing different territories. Border is also a verb meaning to put a border on; to touch at the edge or boundary; to lie on the border; and, to approach the nature of a specified thing. Pronunciation of Border: Border is pronounced bore-der. Border rhymes with order, disorder, and recorder. The word border is also a homophone to the word boarder. What does border mean? Border can function as both a verb and a noun. As a transitive verb, border can mean: to lie on or adjacent to the border/boundary of, or, to put a border on. The country, Canada, borders the United States to the north. She chose to border the garden with rows of pansies. The intransitive verb can mean to lie adjacent to another, or, to be almost like another in character. His personal stories border on the absurd, but they are very entertaining. Two grand rivers border the small city. As a noun, border refers to a part that forms the outer edge; a decorative strip around the edge of something; a strip of ground where ornaments are placed or plants are planted; the line or frontier dividing political territories or geographic regions. She sewed a rather plain quilt with a colorful, intricate border. The couple apprehensively crossed the border into Mexico from Texas, USA. Border comes from Middle English bordure, from Old French bordeure, which is of Germanic origin and related to board. There are several synonyms for border, but the right choice depends on the context and whether the word is used as a noun or verb. Border can function as a verb and noun. The noun form refers to the edge of something or the division line between different territories or geographic regions. As a verb, it refers to the act of being near or adjacent to a certain boundary, or to serve as a boundary of/to something.